The world economic Forum recently published human capital Report 2017, in this report Pakistan is listed in worst countries in the world for Promoting Education and skills development. 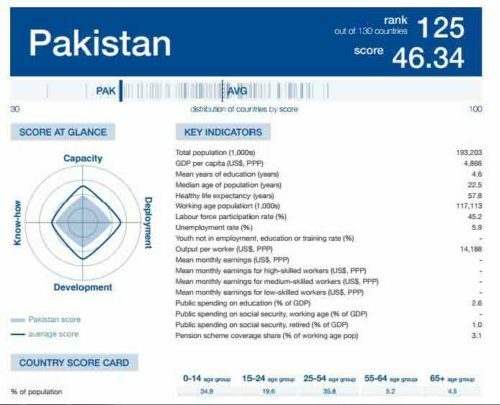 The report tells that human capital potential in Pakistan is worse. The World Economic Forum calculates 130 countries in the world for human capital report 2017. In that list Pakistan stands 125th worse Education system. From south Asian countries only Sri Lanka comes in top 100 list, and the number of sri lanka is 70th and nepal rank stands 98 and India is on 103 rank. The primary education system of Pakistan is showing at bad position where no system of education in different areas specially villages and small cities. Pakistani government should take series action to development primary education system in all over the Pakistan especially rural areas, where no educated teachers and staff available in primary schools and even high schools. The world is growing day by day even the countries that was less developed from Pakistan now goes up from Pakistan. The examples are Bangladesh, India and Sri Lanka and Napal. Even Nigeria is rank at 114 score from 130th list.